Walls are full of stories just waiting to be read. Walls along the streets are where you can find posters advertising anything from items for sale to concerts or political statements. On the walls of homes you’ll find family pictures from current and past generations, school photo’s and children’s art work. Back alleys and walls underneath bridges are often decorated with bright graffiti, illustrating messages to the world. 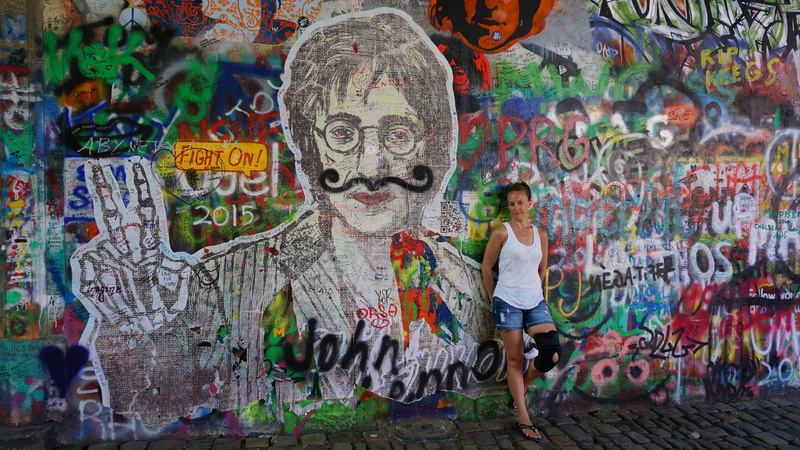 When I visited Prague last June, I made a point to checking out the famous John Lennon Wall, now an iconic landmark in the city. At one time, it was just a normal wall like any other. However, during the 1980’s young Czech’s (who saw the now deceased Lennon as a pacifist hero) began painting Lennon and Beatles inspired graffiti messages and poems on the wall. It was a way to express their feeling towards the communist government. There were often clashes between students and the police on the nearby Charles Bridge, as the youth stood up for their political views and displeasure with the communist rule. Western music was even banned by the government and some musicians were even arrested for playing it. Despite many attempts by the police to paint over the wall, the youth always managed to repaint their messages of peace and love to the world. Today that is exactly what the wall is: a symbol of global peace and freedom. I personally hope that the wall will again be adorned with graffiti, sending inspiring messages of peace, love and freedom to the world! I didn’t know there was a John Lennon wall. That is so cool and you are very luck you got to see it! But sad to hear people are painting over the art…but that sort of encourages others to come and make the wall beautiful again with another set of meaningful messages and images. Hope you enjoyed your trip!